In most of the cities we’ve lived, we’ve been lucky to find a thriving foodie scene with tons of restaurants to try. But despite our best efforts, we’ve always failed miserably at trying them all. I blame this on the fact that we know what we like. And when you want to wile away an afternoon or evening over a bottle of wine and good food, why take a risk somewhere new only to be disappointed? Territorio is one of those places that we know will never let us down. From the first visit, I was enamored of their tablas. Eating picadas as a meal is common in Buenos Aires. Literally translated as “bites”, picadas are generally a mix of cured meats, cheeses, olives and such. 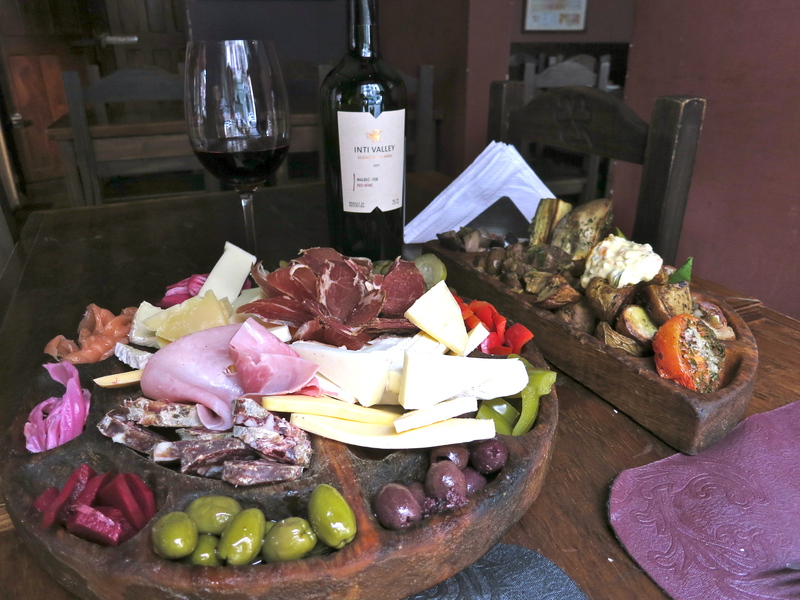 Territorio takes picadas to a whole new level of glory. As their menu promises, the tablas are “simplemente, nuestra razón de ser” — simply, our reason for being. Each tabla comes with a different and extensive mix of picadas, and can be ordered for groups of two or four to share. From experience, I’d recommend that a tabla para dos is enough for tres or more. 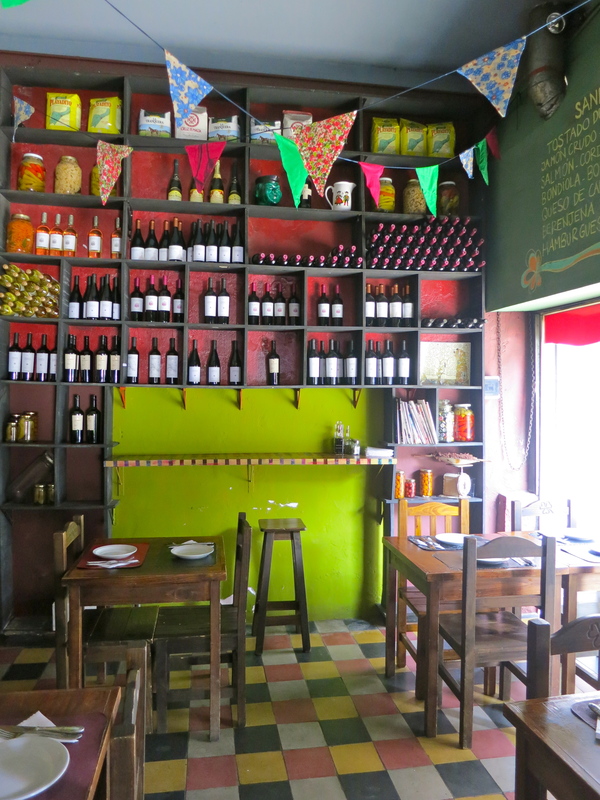 On our latest visit, we splurged on the Gran Tabla Territorio. 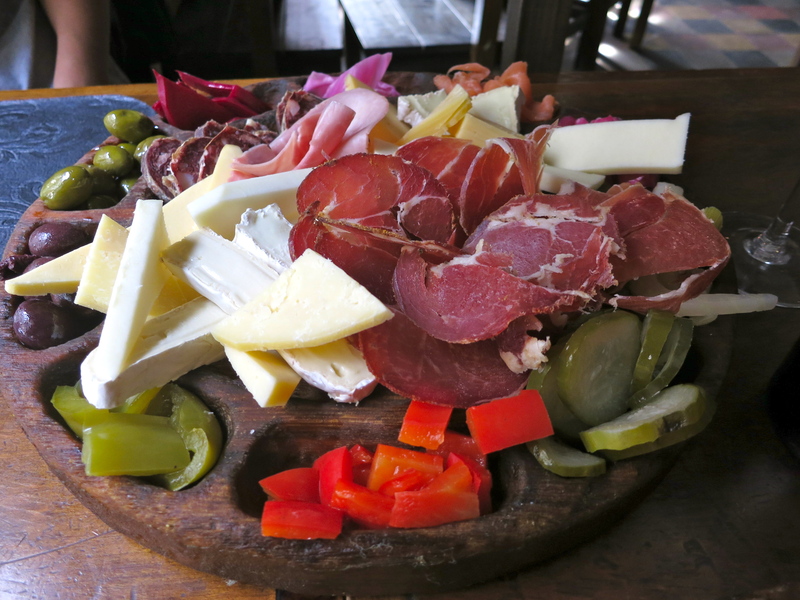 It’s basically a little bit of everything they have to offer: smoked boar, salmon and venison, different cuts of ham and salami, six different cheeses, a huge variety of pickled vegetables, roasted potatoes, sautéed beef and mushrooms…oh, it all makes me so happy. I’m pretty sure I could make a meal out of the cheese alone. It’s a somewhat hidden treasure. 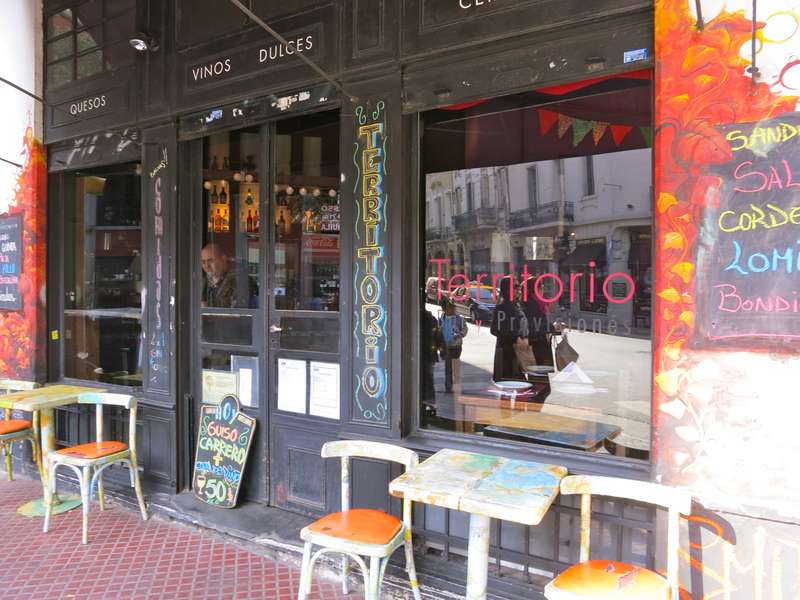 Most days it’s not packed, just an assorted collection of regulars and tourists who’ve stumbled across it, especially on Sundays with the Fería de San Telmo in full swing a block away. The vibe is incredibly laidback. Good music. Muy buena onda. The owner’s usually around, chatting with customers, and the waitstaff’s friendly and showers attention on our boxer, Judah. She likes to come along on the weekends when we sit outside for a bottle of wine and plates of queso de cabra and patatas bravas, as she collects compliments from passersby in languages we may or may not understand. Wall to ceiling shelves stocked with wine. What’s not to love? If you’re ever in the neighborhood – or even if you have to trek over from Palermo – it’s definitely worth a leisurely afternoon visit. Read reviews on Guia Oleo. Katie, your photos are wonderful – makes my mouth water!! Thanks Becky! I credit a good camera and plenty of photogenic subjects. 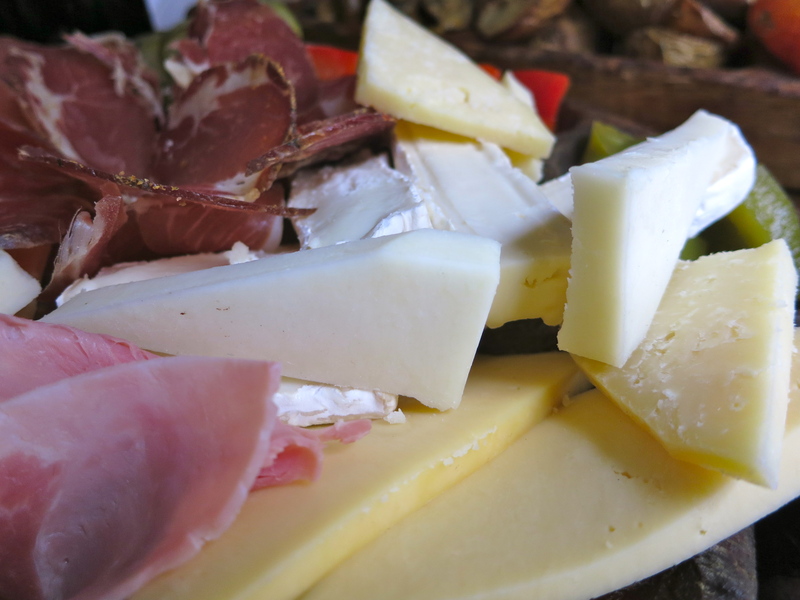 what’s NOT to love about a meal of cheese. mark this one down as imperative when i come to visit. sounds delicious, but moreso due to the way you write about it. Thanks Francy, you’d love it. You take care of the “coming to visit” part, I’ll take care of the rest! Katie, I love what you are doing here! I was wondering about the photography, so you are taking the pictures? They are wonderful and the food looks so delicious! Keep up the good work!! Thanks! 🙂 Yes, I take most of the pictures, or sometimes Gaspar will step in. Last time I was in the States I got a good quality camera, so that helps a lot. I’m still learning how to use it, though!